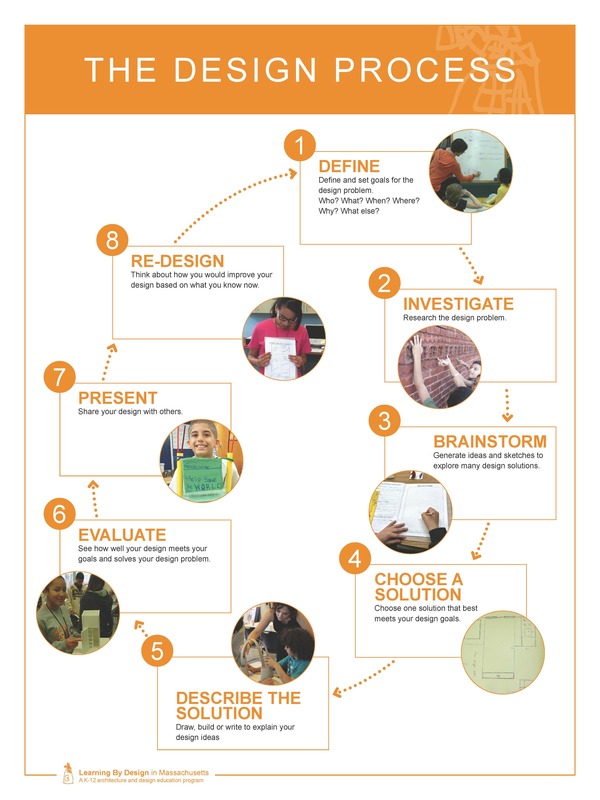 Learning By Design Posters are in! 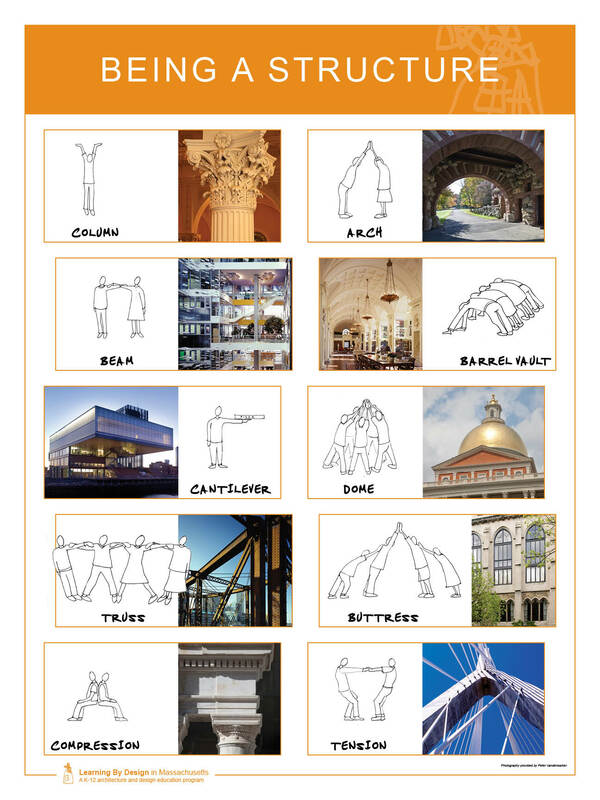 Perfect for educators and parents alike, our posters capture design principals using Massachusetts Buildings; Being A Structure features sketches of making structures with your body with accompanying photographs of Massachusetts Buildings, Building Types categorizes buildings with photographs & the Design Process describes the 8 Step Design Process. Special thanks go to Peter Vanderwarker for his beautiful photographs and to Erika Zekos & Natalie Zanecchia for their design work on these posters. How – Contact us at lbd@lbdma.org to order. 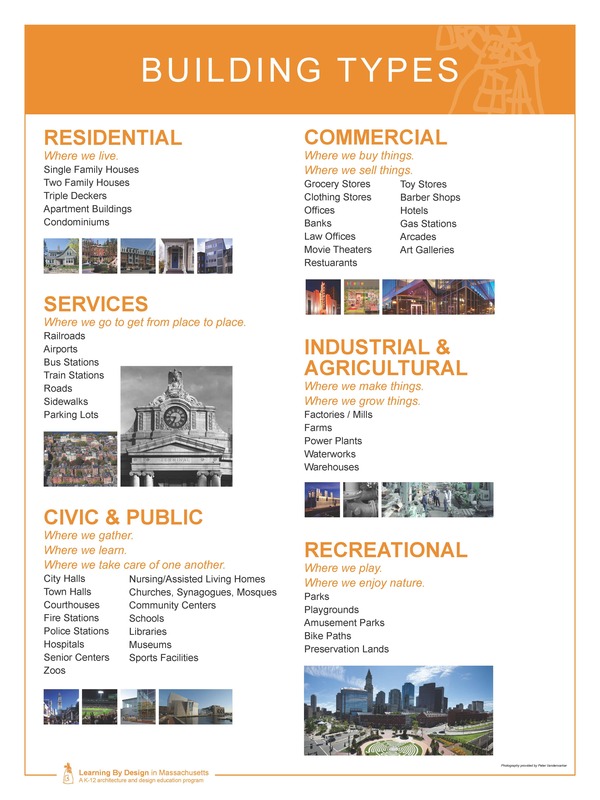 Architecture in Education (Foundation for Architecture, Philadelphia) – A compendium of sensible, specific activities to increase architectural awareness and understanding – chapters focus on vocabulary (with illustrations); design (shapes, pattern, scale, perspective); materials; structures; home; interiors; exteriors; neighborhoods and streets (mapping, walking tours); cities. Design as a Catalyst for Learning (Meredith Davis, ASCD, 1997) – This important work is a “must read” for teachers open to making design a critical part of their students’ learning. An in-depth yet highly readable text, including case studies. Architecture is Elementary (Winters) – Extend students’ visual thinking through architecture. Concepts and activities from simple to complex. Clear text, fine graphics. Architecture: Form, Space and Order (Ching) – How does an architect take space and fashion it into a beautiful building? What elements and principles of design are at work in the process? A sequenced all-graphics compendium–everything you ever wanted to know about architecture-and the visuals to explain it all. Students, Structures, Spaces (Aaseng) – These lessons and handouts focus on: Tuning into the Environment; The Community Where you Live; People Spaces; Structure and Space; and Useful Tools and Techniques. Specific activities cover: how spaces feel; drawing floor plans; community surveys; cognitive mapping; school spaces; pace; scale; vocabulary. Round Buildings, SquareBuildings and Buildings that Wiggle like a Fish (Phillip Isaacson) – Photos and text work perfectly together to convey the power and the beauty of architecture. A unique and valuable book, an award-winning children’s book, sure to inspire educators and children alike. A Changing American Cityscape (Renata Von Tscharner) – Seven 11″x33″ color posters detail the changes in a fictional city, years 1875 to 1990. Guide included, but the wonderful posters speak for themselves. Dream House Design: Kennedy School, Franklin; Cambridge Friends School, Cambridge; UMass Lowell Design Camp; SMARTS Collaborative, Attleboro; Mass College of Art, Boston; Murphy School, Dorchester; Writer’s Express, Somerville. Designing Our Community: King Community andMorse Schools, Cambridge; Hawthorne Youth & Community Center, Roxbury; Winter Hill after-school program, Somerville; Fenway High School,Boston; Mission Hill Summer Camp program, Roxbury. Box City: Community-Building Programs Cambridgeport School, Cambridge; Kenny School, Dorchester; Bridge Street and Leeds Schools, Northampton; Conte, Crosby, Egremont, Stearns, Williams Schools, Pittsfield [in collaboration with the Berkshire Museum]; East Taunton School; Central Catholic School, East Boston; St. Joseph’s School, Needham; Olmsted School, Easton; Peck School, Pittsfield; Pulaski School, New Bedford. Entryway Design: Boston Arts Academy; Sparhawk School, Salisbury; Holyoke High School, Holyoke; Saltonstall School, Salem. Places to Learn: Memorial School, So.Natick; Holyoke High School, Holyoke; KennedySchool, Franklin; the Engineering School, Boston; Fenway High School Boston. Outdoor Learning Spaces: Cabot School,Newton;RicherSchool, Malrborough; Boston Schoolyard Initiative collaborations: Dorchester, Roslindale,West Roxbury. Designing Our River Heritage:Edison Middle School, Brighton; Parker Middle School,Taunton. Kids Design a Sustainable Future: Warren Prescott School, Charlestown; King Open and Baldwin School, Cambridge; Egremont, Pittsfield; Murphy, Boston. Young Artists Imagine Architecture: The Institute of Contemporary Art,Boston. Professional Development Workshops: The Boston Society of Architects; Suskind Young at Arts (The Wang Center, Boston); Preservation Worcester; the Bostonian Society (The Old State House, Boston); SMARTS (Southeastern MA Arts Collaborative); Antioch New England Graduate School; ATMIM (Association of Teachers of Mathematics in MA); TEAM (Technology Education Association of MA); Boston Nature Center/Mass Audobon; Museum Institute for Teaching Science; NESEA, GreenBuild and AIA Conventions. Summer Content Institute:Old Rochester Regional Schools, Mattapoisett. Citizen Schools: 12-session “Architecture Apprenticeship,” an out-of-school-time middle school curriculum. House of the Seven Gables, Salem: architectural awareness activities for visiting classes, focusing on the history and structure of the 17th century timber-frame building. Helping Kids Thrive: “Workspace Architecture” design activities to complement Ms. Magazine’s “Take our Daughters and Sons to Work” project. Steppingstone Foundation: “My City”: design and math activities for rising 5th graders in their College Success Academy summer program. Horizons at Dedham Country Day: Box City program designed to be implemted in grades K-3 during Horizon’s summer enrichment program.